Can 04 be RANDOM HARVEST? "What do you mean, "pick him up'? You pick him up! Yes, it could...and is. As well as 05. That's Ronald Coleman's back in 04, and that's Greer Garson's back in 05. "Harry, step on it, you're up next. They've changed the line up and they want the ventriloquist act...now!" "Ronald I know you said your eyes would never leave mine, but a man has just collapsed...you need to see if he's dead or not! I can never remember where the pulse is." So let's try this one. I fliched this from another thread. I don't have a supply of good bets for captions right now and my scanner is on the blink...so if anyone has a photo to put up for _07_, please put it up. Let's let _06_ take some hits first though. Maybe by *Fri* a good time for the next one. Okay? Cymgor? RayMilland? Rich? Fred? Anybody? Let's put one up on Fri, if you are so moved to do so. Thanks. "No, my friend Mitsy drew the high card. 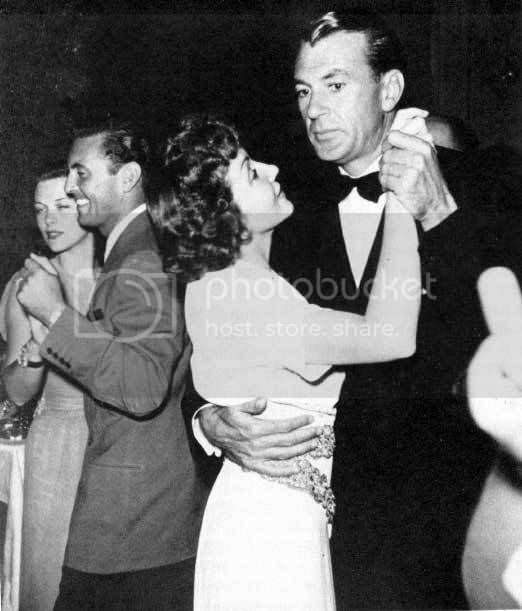 That's why she's the one dancing with Gable." "Don't look now, but who's the dish dancing with Grant? "Oh look, Gary, see that couple next to us. Isn't that the woman who used to live next door? Yes, I remember now, I used to tease you both about the way you flirted with each. Didn't she go away and have a baby or something? Anyway, what a coinicidence? Should we go over and say hello?" "...And you think you've won? Oh. goodie! What does "Dogfight" mean, anyway?" "Oh, Coopy. I must know the name of the shampoo you use. Your hair is so soft and shiny!" "Wait a minute...so all I have to do is sign on the dotted line and I get a pair a socks a day...for life?" "Damn right we'll put it in the contract! If Sinatra invites me to sit at his table, you get an extra grand. And another $500 for anybody else in the Pack who's present. Well, one bill for Bishop." 07 "Man, can you believe all the paperwork you gotta fill out just to get a library card these days??" "Lesee here...Somewhere, beyond the ocean...No, beyond the bay...uh, across the Sound...? Damn! Still don't have the right term yet! "If this guy knees me in the head one more time, I'm gonna punch his lights out. I was here first and I ain't giving up the seat. I hope he doesn't make me take off this smoking jacket. Here I am applying for a job and I can't even remember my name. I may be stupid but at least I look cool. Arrggggh, there he goes again, okay, this guy's history. Hey, wait a minute, that last kick just made me remember my name. It's Percy, yech! Someone post a pic....Pleeeease!! I don't want to do it because I did it last time, but I really want a new picture! (WWF Dress Rehearsal) "Now tomorrow night when we do this, we'll add a lot of groans and yelling to make it more convincing. Oh--and don't forget your bottle of fake sweat and the fake blood too. Last time some of the folks in the front row of the audience threatened to demand their money back because they didn't get splashed with body fluids--let's make sure we give them a good show this time...watta ya say?" "Believe me, I'm NOT a Martian! I needed money and some guy offered me $500 to come up here on the Empire State Building and pretend to be one! I'm serious!" "Did you finish your mission Zorkle?" "Yep, those humans will fall for ANYTHING!" Fades out with evil laughter. "Get the mask, get the mask! WWF doubles the purse if we unmask him!" "THIS IS YOUR MOMENT...I'VE USED TWICE AS MUCH PROPELLANT"
"im casting a hex upon you, monster!" "no, no please! spare me!" phew! thats was hard for me to say. heehee! that wasnt very good was it, laffite?